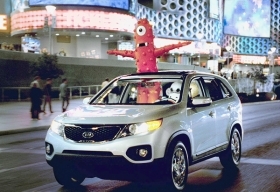 In the United States, Kia sold 78,950 Sorentos through September -- a gain of 327 percent over the same period last year. SEOUL (Bloomberg) -- Kia Motors Co. posted record quarterly profit in the third quarter as new models increased sales at home, in China and the United States. Net income surged 66 percent to 666.6 billion won ($593 million) in the three months ended Sept. 30 from 402 billion won a year earlier, the company said in a statement today. That beat the 504 billion won average of 16 analyst estimates compiled by Bloomberg. Sales climbed 26 percent to 5.69 trillion won. Kia raised global deliveries 24 percent as new models including the K5 midsize sedan and revamped Sorento sport-utility vehicle lifted sales at home and overseas, according to company data provided before the earnings announcement. In South Korea, Kia’s biggest market, sales rose 25 percent even as deliveries at Hyundai Motor Co., which owns 34 percent of Kia, declined 12 percent. Operating profit, or sales minus the cost of goods sold and administrative expenses, rose 34 percent to 421 billion won, Kia said. The carmaker’s global retail sales increased to 541,884 vehicles in the third quarter from 438,467 a year earlier, according to company data. China sales climbed 18 percent and North America deliveries 8 percent. Higher profits from Kia affiliates including Hyundai Mobis Co. and Hyundai Steel Co. also boosted earnings. Hyundai Mobis, South Korea’s largest auto-parts maker, said yesterday third-quarter profit jumped 45 percent to 605 billion won as Kia and Hyundai Motor, its biggest clients, sold more vehicles. Hyundai Motor said yesterday its net income surged 38 percent to 1.35 trillion won for the quarter on higher sales in overseas markets.